This was one of the straws that broke the 'Joe's not sure if he's going to start a blog' camel's back. I was doing some browsing of cool artists blogs, when I found Dean Trippe's page (good stuff- you should check it out ). Anyway, while looking through his page, I found a 'Draw Supergirl' meme (I didn't know what it meant either), where various artists come up with their own take of the famous comic character. I thought I'd take a shot. 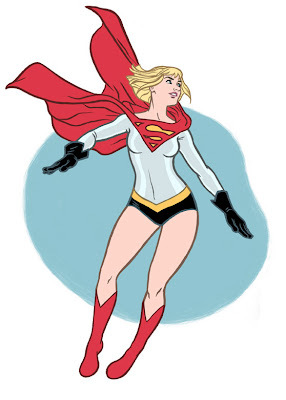 I think I hate you a little bit for this, because I won't be happy until Supergirl actually looks like this. I'm going to pretend that my Supergirl grows up and becomes your Supergirl. Well that's cool, because I sorta hate you for your very cool and hip Supergirl. Does this mean our hate cancels itself out? You know.. I suppose it does. Now that we're not enemies we'll have to be SuperFriends.